UNDER THE STARS is our latest package for special interest groups. 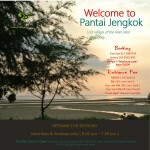 Pantai Jengkok is the first village of ther Mah Meri. Some Mah Meri’s are still staying in the village despite the lack of amenities like running water and electricity.